A Bank of America office building in Plantation just traded hands for $13.85 million. The Kislak Organization paid about $173 per square foot for the 80,000-square-foot office building at 1776 North Pine Island Road. Transatlantic Investment Management was the seller. Records show Transatlantic bought the property in 2012 for $10.9 million. The seller was represented by David Duckworth, John K. Crotty and Michael T. Fay of Avison Young, according to a press release. Avison Young’s George Vail helped secure $12.05 million of financing from Popular Bank. Built in 1986, the three-story office building sits on about 5 acres of land. It sold 90 percent leased to a tenant roster that includes accounting and law firms. Bank of America has occupied the building for a little more than a decade. Kislak, led by Thomas Bartelmo, focuses on the ownership, management and brokerage of commercial real estate with the bulk of its portfolio consisting of multifamily properties. Last year it sold the newly renovated Miami Lakes Corporate Center for $12.18 million. The office market in Plantation has grown thanks in part to companies like Virgin Voyages, American Express and Motorola opening offices nearby. 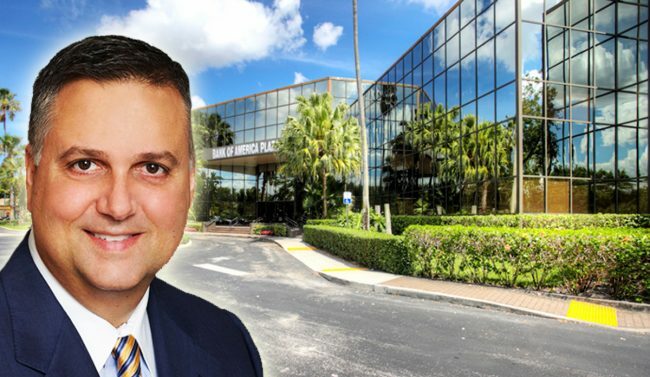 According to a recent Avison Young office report, Plantation had the highest total net absorption level in Broward County in the third quarter, with 78,350 square feet absorbed and no new construction during the quarter.